Of course, the advent of digital photography, disposing as it did with the endless cost sink of film and film processing, pretty much created Garreteer photography on its own. 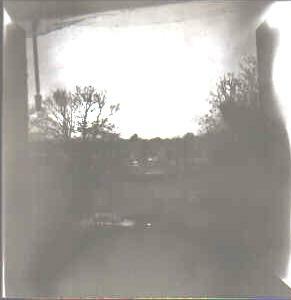 That, and the new trend to explore the possibilities of cheap, badly-made, often “joke” cameras, but there was always one other option open to the person living in a single room or small flat on a low budget, and that was pinhole photography. Complete kits, including processing chemicals and equipment, are available for about £20, and the Science Museum in London sells a 35mm pinhole camera for a tenner: just add (and pay to process, of course…) film. If you are the fortunate possessor of a digital SLR, you can even get into digital pinhole photography, by replacing the usual lens with a lens cap with a suitable pinhole in it, and excellent results are possible this way. The real attractions to the Garreteer of pinhole photography are the craft, hands-on aspects to it, and the possibility of creating truly unique images of a kind that normally require expensive equipment. Pinhole cameras can be made out of almost anything – there are rumours of one having been made out of a roast duck on one occasion – and almost anything can be done with them: pinhole cameras have been left in place for months at a time to track the passage of the sun and stars across the heavens. With care, attention and a roll of black binbags, any room can be made into a darkroom long enough to process pinhole images. A wardrobe – with care, obviously enough – or a walk-in cupboard can serve the same purpose. The chances are that your first pinhole camera kit will contain a red filter that can cover an ordinary lamp and light your processing work. If you are using film, you can of course print off as many copies of your results as you like: home-processed photography paper will need to be scanned to produce something that can be reproduced. In any event, your results will be interesting, unique to you, and the envy of less courageous souls.